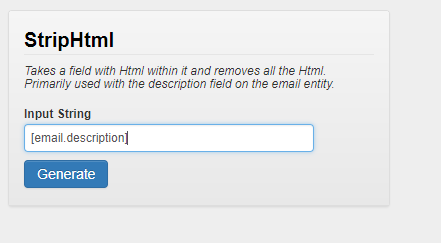 In this business scenario when a user converts an Email to a Case you need to ensure that the description field (Body) from the Email is copied across without formatting to the newly created Case. And if true it will update the description on the Case record with that of the Email description less any formatting. 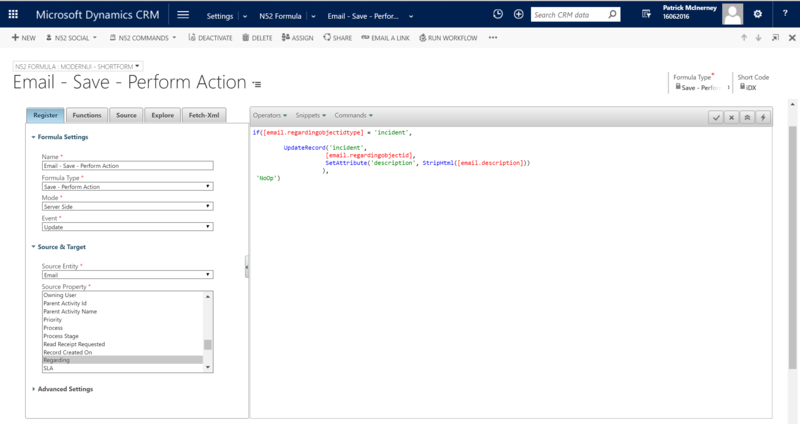 *Note 1 : When a user clicks the 'Email to Case' menu option the CRM platform behind the scenes creates the Case record & then updates the Regarding ID field on the Email record with a reference to the newly created case. You can verify all of this by looking at the audit trail for the Email record. Please see below the wizard you can use to create the StripHtml() function call used in this formula. Note that for this Input String , you will need to expand Source and click on Description.